Keeping things going today, we examine all 32 teams’ training camps to date, continuing things with the AFC West. The team has confirmed that Ron Leary will start at left guard. While Leary spent his time at right guard last year, Leary began his career playing on the left side in Dallas and performed well, posting offensive grades above 70.0 in three of his four seasons with the Cowboys. 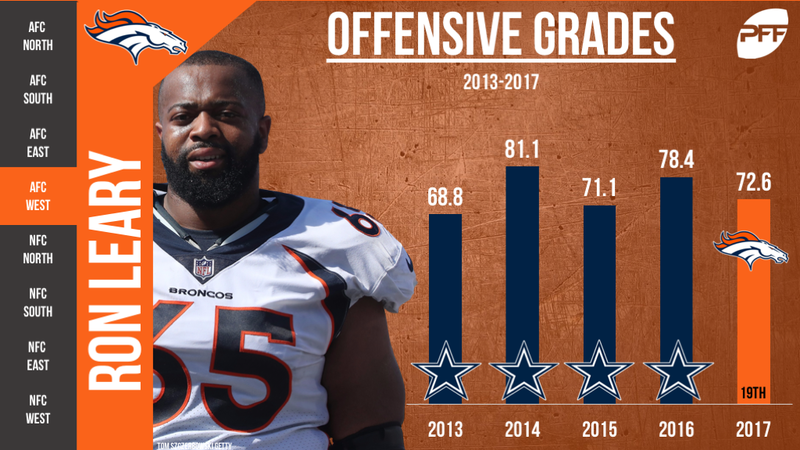 Leary was far and away the most consistent offensive lineman for the Broncos last year and he ended the season with a 72.6 offensive grade – good for 19th among qualifying guards. According to reports, Chiefs quarterback Patrick Mahomes has thrown eight interceptions across seven training camp sessions. This is likely nothing to worry about as it’s still only the first week of training camp and it’s the perfect time for him to come to grips with what he can and can’t do as a starting quarterback. In his final college season, the former Texas Tech gunslinger torched Big-12 defenses, finishing the year ranked second in adjusted completion percentage (82.9) and passer rating (125.5) when working within a clean pocket, two metrics that have proved to be our most stable in predicting college-to-pro growth. ESPN’s Adam Schefter has confirmed that cornerback Jason Verrett will miss the 2018 season with a torn Achilles. It’s a crushing blow for Verrett, who suffered the injury during the same conditioning test that all Chargers players took prior to the start of camp. 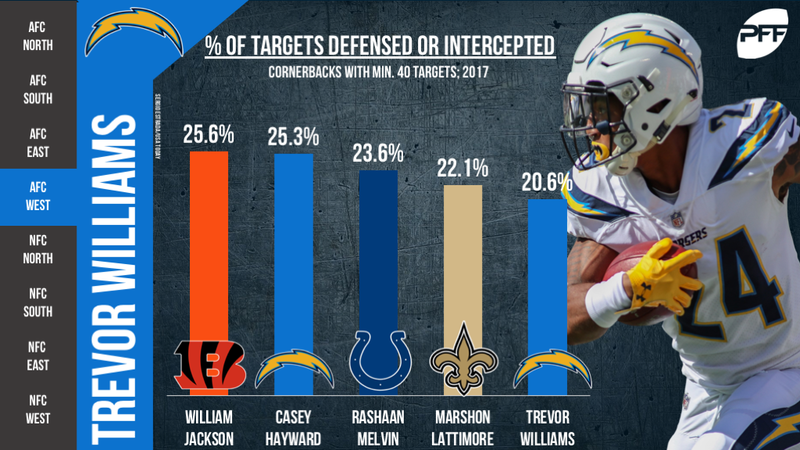 With Verrett out again, third-year cornerback Trevor Williams will reclaim his spot on the perimeter, which is where he excelled last year and sneakily graded as PFF’s 18th-best cornerback with an 80.2 coverage grade. With incumbent left tackle Donald Penn on the PUP list, first-round offensive tackle Kolton Miller opened training camp as the Raiders first-team left tackle. The former UCLA tackle finished the 2017 season with an 87.5 overall grade and boasted the highest pass-blocking efficiency among Pac-12 tackles last year, so there’s reason to hope that Miller can grow into the role in the coming weeks of camp.